The following interview is done with Zhema Rodero of Vulcano (1980 - 2015). 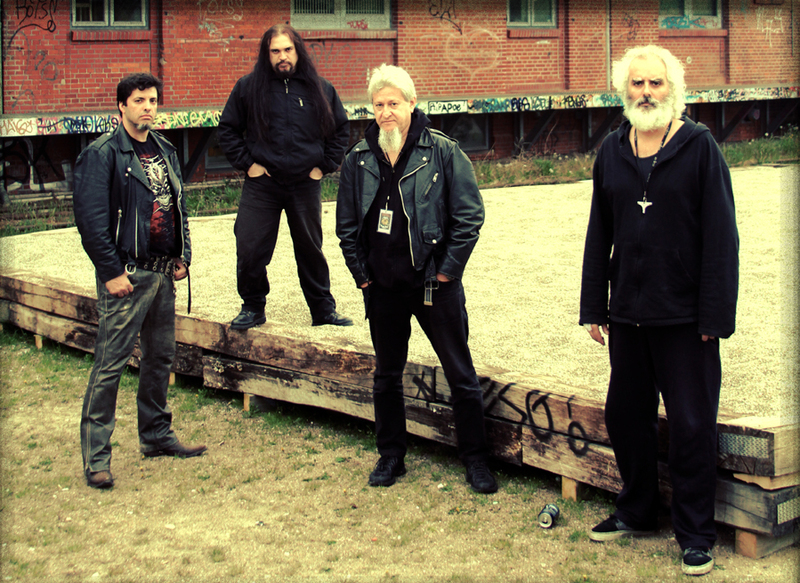 This interview was originally done for the 'zine Garm/Cry of the Wolf (Germany). 1. Zhema, first, thanks a lot for your interest and still believing in printed magazines/fanzines and for keeping the old classic flame still burning through the technical revolution! Well, I don’t think I have to ask anymore about yourselves and who you are and the typical questions about your musical activities, so I will try to keep the conversation more about the past, present and future of the Brazilian Metal scene, the different economic and political situations, and more… Alright, let’s begin the first question about your discovery of Metal music. When did you discover Metal music personally and can you remember how the feeling was at that moment? Zhema (VULCANO) - Since the beginning of the 70s when I was 12 years old I listened to American rock'n'roll bands like “Three Dog Night”, “Creedence Clearwater Revival”, “Doobie Brothers”, etc. But, one day I was passing in front of a neighbor’s home and I was invited to come in for a rock party, so I listened to “Black Sabbath”'s first album. O.K, I thought, it’s a dense and obscure style of rock. This is my kind of music. Zhema (VULCANO) - The fact that I started to listen to heavy music that didn't play on Brazilian radio broadcasting, brought me closer to different people, and most of them were guitarists, drummers and bassists, so I lived in that atmosphere and sometimes I tried to learn to play guitar. Finally, I got it, but I was a bad guitarist, but I was still into the heavy metal music. Zhema (VULCANO) - It was something like trying to buy a car nowadays, and I'm not talking about imported instruments, because those were almost impossible to think about. Another thing, I’m talking about 70s. Zhema (VULCANO) - There was not a bad concept regarding long hair here in Brazil in the past, but before the 80s for example, some public places like banks, did not allow employees with hair over the ears, etc. But it was not so hard, because Brazil always has permissive people and because of this characteristic we didn't have great problems. For example, I used to have long hair since I was 12 years old and I studied, became an engineer, worked in a steel plant and right when I retired, I cut my hair. But when we are talking about censorship, oh yeah! It was very hard to deal with them. Every lyric or musical theme was submitted for censorship, every gig you produced was authorized by censorship, every rock scene was a spy for censorship, and this was a great problem in a military government. The militaries didn't bother with religions, so, we attacked the religions hard! Zhema (VULCANO) - For me there is not much difference. In a military dictatorship the people don't have freedom of expression, and the militaries didn't care about human rights, but there was employment and security for your family. Nowadays we have total freedom of expression, but few are employed, no, and I mean no security. We are exploited to our bones with taxes. Also, there’s no health system and education for our children. Rio de Janeiro is a war ensemble, drug dealers fighting themselves and all of them against the police; corruption in all segments of society, etc … the Hell is here! Ah, Ah, Ah. In the military government they would all be dead! Zhema (VULCANO) - Nowadays the government is socialist, behind the veil of democracy, but they are socialist. There are many political programs to aid the less affluent and with this political system they get to distribute a bit more money… I’m not against this program, I agree, but this program doesn't help the arrested, prostitutes, tragedies, young offenders, etc, so I don’t agree. Agrarian reform is necessary, but most of the great farms are controlled by the politicians, banks and corrupters to wash money. The people living in the country don’t have any opportunity to work on their own land. It’s very hard to talk about this matter, because it is totally controversial, some people hate this current situation, others think it's not so bad and there are many others that think it's a great situation. I’m a fortunate Brazilian because I have a house and one car; I’m retired and have insurance to live in tranquility, but I need to pay very high taxes with my own money for health insurance, education and security. We pay high taxes for this, but they use it for corruption. This is the great problem of Brazil. Dishonesty. 2.3. Well, in 2014, Brazil had the football World Cup. It’s not just about the sport now, but also the economic and political side. Of course in every sport nowadays when it comes to a lot of money there exists a lot of political influences. So what brought this world cup to your country? Because history shows us that when any major sporting events or Olympics are over, the over-built and newly built places and stadiums are empty or only half full for later sporting events. How does the situation look like today in Brazil? Zhema (VULCANO) - You stated everything in your question. First of all, I hate football, because this sport is mainly here in Brazil only to wash money of drug cartels and corrupt politicians. Nobody cares about the sport besides the ignorant, they use the clubs to wash the money earned with trafficking, weapons, corruptions, etc. The world cup in 2014 did not bring any benefits for the people, only to politicians, big business, constructors, rich families, senators, all of them earned money. For example, they constructed a stadium inside the Amazon Jungle (? ), you have no idea how big that place is! Maybe in 2150 an archaeologist will discover it! ah ah ah. Thank you for 7 x 1 !!!!!!!!!!!!!!!!!!!! Zhema (VULCANO) - Certainly! We can divide the Brazilian origins in three parts: South, South East and North East. The main reason for that was the climate. You will find Germans, Italian, Polish in the South; in the South East is Portuguese, Spanish, Italian and Japanese; and in the North East, strong influences of Africans and descendants of the original Indians. The Indians of the South and South East were exterminated or pushed in the direction of the center of the continent, like Paraguay for example. So, the culture is totally different, and unfortunately, so far from one another. I use to say, there’s no Brazilian people, because besides the origins, a people needs to have their own culture and we do not have that. We take a bit of each European country, mainly Portugal and almost nothing of the true Brazilians, the Indians. My father is Spanish, for example. The good side of these cultural differences is its representation in the Brazilian Congress, which creates a cultural synergy. Brazil is like a continent of its own and like a continent has different cultures and races. 3.1. We all have our ethic backgrounds and historic backgrounds of our families … are you proud of your ethical origin and where your ancestors came from? Zhema (VULCANO) - Yes, my parents came from Spain from Salamanca and all of my uncles too. Certainly, I'm proud. My wife's mother is of Portuguese origin, and her father has native origin, her mother was Bugre from Mato Grosso. 4. Not all of the bands used in their lyrics the English language and used the Portuguese mother tongue, like VULCANO in the beginning for example … English as a foreign language in your country was and still is not well established in schools etc. as like in European countries, that’s right? Can you remember your first song you create? Zhema (VULCANO) - You are right; our regular schools teach almost nothing of the English Language, only an introduction. The first song that I composed in '75 was “Poluição” (pollution?-ed.) but it was devoid of musical arrangements, just guitar. After that I did a lot of songs, but my first complete song with arrangements and other musicians was “Besta Cibernética”. Zhema (VULCANO) - You are right! The main reason was Brazil never had a tradition of Heavy Metal music. The scene was small and neither the media nor record companies were interested in this kind of music. Only the small labels supported the bands, but they didn't have enough money to promote it, this was on account of the tape-trader. Zhema (VULCANO) - I personally think that there’s two reasons for a band to stop; the band was seeking fame and fortune and didn't get it, so they were fake; or other priorities like families and jobs made them stop, besides that, there’s no other reason. Zhema (VULCANO) - São Paulo always had the biggest scene in those times, more than Belo Horizonte. All gigs and festivals happened in São Paulo, even I did numerous festivals and I invited Sepultura, Dorsal Atlântica, Mutilator and many other bands out of São Paulo. I used to organize many festivals. There was no support or sponsorship, we needed to do everything with our own money and at the end we had great losses. The tape-traders of the time were responsible for spreading the Brazilian bands all over the world. They were important at that time. Nowadays everything changed, access to good equipment has become a reality and the internet replaced the tape-traders. Zhema (VULCANO) - Like you said, the world metal scene has become saturated, there are a million tons of new bands and every band sounds the same. Nowadays my primary concern is to watch gigs and pay attention to the attitudes of the musicians. I abhor musicians that put virtuosity in front of feeling. Nervochaos, Skinlapsy are bands that excite me. Zhema (VULCANO) - I have licensed two albums by Cogumelo, "Live!" and "Bloody Vengeance" to re-releasing in CD format and Cogumelo produced two more albums that the copyright belongs to them. I can tell you that João, the owner of Cogumelo, is a very honest person, everything was agreed on and fulfilled. If there are some bands/people dissatisfied with him, I don't know about that exactly. I liked to work with Cogumelo and if you asked me if I would work with him again, I'd say yes. Zhema (VULCANO) - Because the guy behind Cogumelo, João and his wife are perseverant, I think. Please, as you know, nowadays it's not possible to sell CDs, vinyl, etc, in enough quantities to earn profits and keep a business, so what other reason do you have to continue? I know his wife has another shop of popular rock, so this fact can contribute to keep Cogumelo working. I created my own label, RENEGADOS RECORDS, and I know exactly that it is impossible to earn cash releasing CDs and LPs. I lose money, but I'm perseverant. Zhema (VULCANO) - No, I think if we have this easiness we must to use it the best way. I just miss photography on paper, there is a charm with photos on paper, because you can take a look at them in your hand and remember the great moments immediately. When you take a digital photo you don't worry about anything, just shoot, and download onto your PC... nothing special! On the other hand, millions of people use this easiness hopelessly and get addicted and can't stay away from their devices and applications, but they are stupid. 7.1. Like I wrote before, record-labels come and go, like everything else… what do you think about Metal and business? In general, the music industry has changed, let’s say, in the last ten years. The revolution of the internet didn’t spare the Metal “Underground” and Metal music, and the World Wide Web with its many possibilities is used by a lot of individuals, musicians, and bands, whether it be email, a personal website, or profiles on social websites like MySpace or Facebook. In the past for people to listen to an album they HAD to buy an album, regardless if it was in the format of a cassette, vinyl or CDs. But that is no longer necessary with internet downloads and free accessible sites such as YouTube and various others. We can look at these possibilities as positive or negative. But in the end we all have to live with the knowledge that it is just the way it is at the present time. What is good and bad in your opinion and what do you think the versatility of the internet offers us? Zhema (VULCANO) - The speed of communication and research possibilities are what most appeal to me on the internet. For example, I can question you now about a fact that occurred in your city this morning and you can tell me your version in less than a minute. Or I can do deep research about your city and I can know a lot about it in few minutes. This is great! But it's stupid that there are those who deprive themselves and live exclusively on behalf of those technologies. Zhema (VULCANO) - I totally agree. Like I said before concerning photographs. This easiness must be used for communication and research, not for art. Art doesn't co-exist with technology. 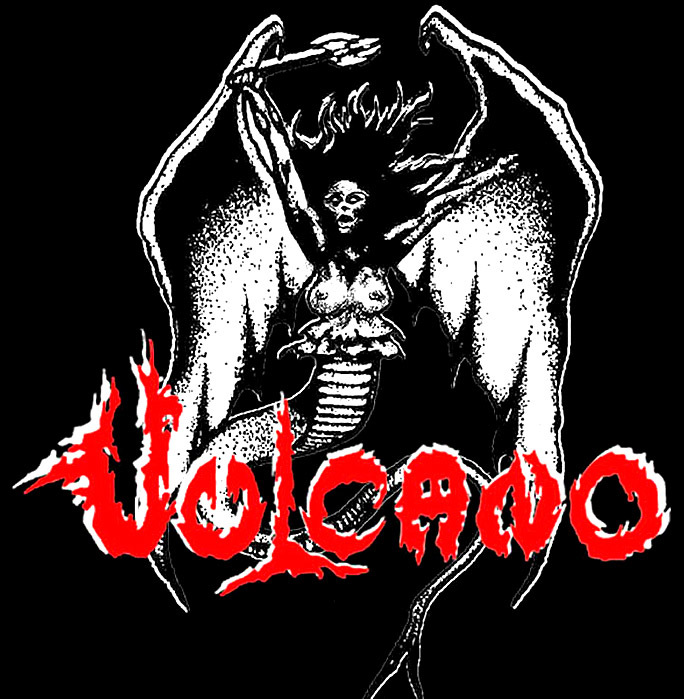 Zhema (VULCANO) - I even released four issues of a fanzine in the 80s. I spent a lot of time of my life writing and making layouts. I can say to you that I can't read a webzine in its totality, but I can read an entire fanzine without it being repetitive, the same case with photography. Zhema (VULCANO) - We can say that Brazil is a Christian country. Out of one thousand homes, nine hundred homes are Christian. But Christians are more permissive than other religions and they have their own lives and do not interfere in others. They have a normal life, in employment, in the home, or for fun. The big and dangerous problem is concentrated on the Church of Rome and on the Protestant entities. As representatives of Christ, they manipulate the faithful in any way that interests them. This is dangerous. I think that here in Brazil we have three great powers working for their own cause: Banks; Religion and Rede Globo (television/media network-ed.). These three powers get whatever they want. Zhema (VULCANO) - Never! Religion is not interested in me or somebody like me. They want to hook blind and stupid people for their army to create money. But I can't agree with ignorance and darkness imposed by religions, not just Christianity, but all of them! God is evil, it's enough for you to read his sacred book, the Bible, only the fact that "he" put 10 plagues on a people just because they were not "his" people is enough to understand that god is evil. Zhema (VULCANO) - Here in Brazil nothing like that ever happened, even with all the anger behind our metal music, because, like I said before, ninety percent of all Brazilian families are Christians. Our parents, uncles, cousins, and brothers and sisters are Christians and thus, we would be attacking them. Latin American family ties are very strong. We'll always attack the institutions and religions because we are not hypocrites, but we would not emotionally harm our parents. I think this way. About this in Scandinavia, like what you are telling me, once I was asked in an interview if the cover of the album "Bloody Vengeance" somehow influenced those acts. 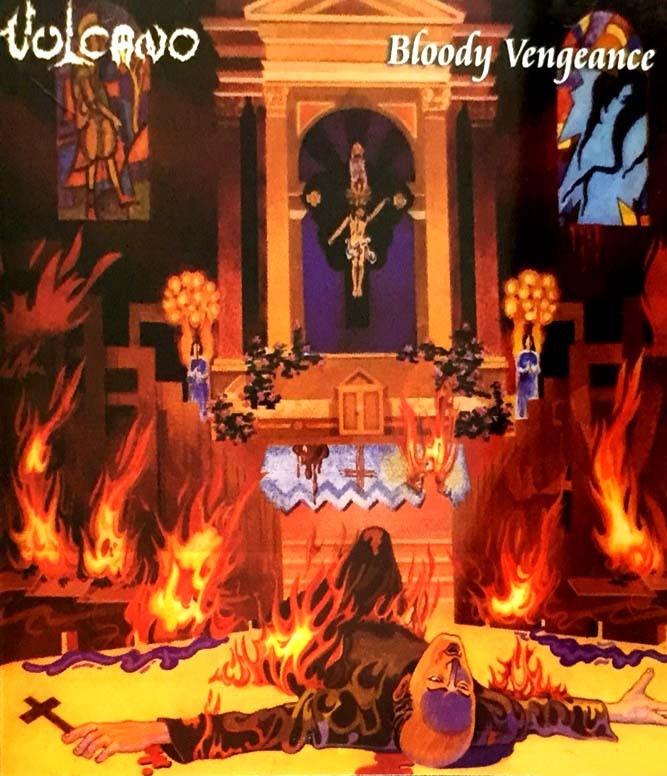 Also, touring in Europe I heard that the painting on the "Bloody Vengeance" cover caused a great impact. It's enough to say that the UK version of the album in 1987 was released with another cover. Zhema (VULCANO) - Foolishness !!! No sense !!!!!!!!! Zhema (VULCANO) - I do not carry that feeling because I'm still in that same atmosphere, I keep doing my songs as before, but with a little more skill, and my idols remain the same. I do not care about fashion, and I never have. I do it my way and I believe that delights me. However, it is certain that extreme music has gotten popular and has become trendy, something like to look cool in front of your friends. Zhema (VULCANO) - The Heavy Metal music means my way of life. This is the air that I breathe. I used to say everyday I wake up, I'm ready to Metal. I spent half of my life with Metal, so I can tell you that I experience good things everyday. Believe me! Zhema (VULCANO) - I want to add that to better understand the Brazilian metal scene you need to stick around for a long time. Here everything is much more difficult and complicated and disorganized. Here there is not a big Metal scene like many people think, you need to work hard to put out an album or produce a show. Brazil has warriors of metal, this is real! We Brazilian Headbangers fight a battle every day. Thank you for the opportunity to answer those great questions and thank you to the readers for your patience in reading them. Keep Banging!